When dealing with video fi les of diff erent formats, you often get annoyed with the fact that a Codec is often missing and needs to be installed. What you need is a quick playing program that also runs comfortably on somewhat older computers and notebooks. Start the installation and follow the wizard until the step “Select components”. Here, select the installation type “User-defined”. Decide whether you also want to install the browser plug-ins, and then scroll to the file type allocations. If you want to play individual fi le types in “Audio files” and “Video files” like “MP3” rather with another program, deactivate the control tick mark for this type. Leave all unknown types active so that they can be played by VLC media player if there is any confusion. Then click “Next” and “Install”. The program contains numerous Codecs and plays almost all common audio and video formats like AAC, AVI, FLV, MPG or OGG immediately. It also supports the streaming of MPEG and DivX videos. Moreover, the latest version now also uses separate graphic processors (GPU) as well as DSP for playing HD videos. A special advantage of the VLC media player is its capability to play even damaged or incomplete video fi les as well as fi lms opened from other programs. 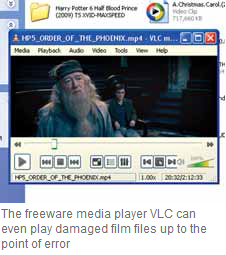 If, for instance, the Windows Media Player does not want to play a damaged file, open it in VLC media player. Even this will identify the defect but will try as against the Windows’s playing program to repair the fi le and at least play the part that does not have a defect. The original remains unchanged. Playing used videos is helpful is helpful when you have to convert a larger video fi le or if you want to quickly look into a download that has been started to see whether it is the video you wanted.